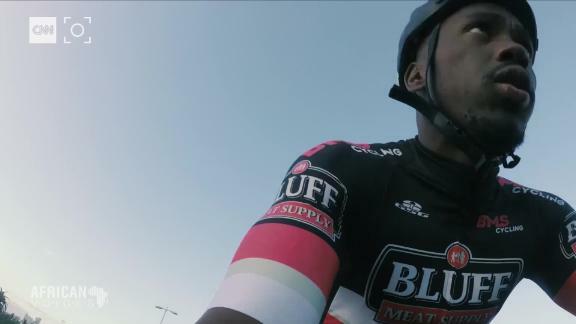 Before the sun has shone its morning light on KwaZulu-Natal, South Africa, Mhlengi Gwala has biked 65 kilometers and run at least five along its beautiful coast. He's not the fastest, and he's not a full-time professional athlete, but he trains like one -- as if he's got something to lose if he misses a day. "Nobody died from working hard," Gwala told CNN after his monster morning training block. By 7 a.m., Gwala is in the kitchen making breakfast for his two children before heading off to work. Afterward, he'll throw in a 3km swim. At the age of 27, Gwala should be in his prime for his sport of choice: triathlon. Except he isn't, after being attacked at gunpoint by three men, who according to Gwala, then pulled out a chainsaw, and began to saw into his legs. Gwala grew up at the foothills of the rural South African village of Ndwedwe, to a family of cow herders. On these large swaths of barren land, he learned to run -- chasing cows and classmates. A self-described rebel, he would often swim in the forbidden river in the valley. "If I want to get strong, I come and train here," Gwala told CNN, as he glanced up at the massive mountains of his hometown. Today, he's here visiting his family. But first, a run. Jogging up the steep dirt trails, he pointed out his primary school, a stone's throw from his childhood home. From there, he said he would organize running races with no knowledge of the total course distance, and no prize other than the satisfaction to participate. Today his training is much more disciplined. Every kilometer calculated; every pace clocked. Gwala moved to neighboring Chesterville for university. It wasn't long before he fell in with a bad crowd and began dabbling in drugs and alcohol. "I told my mom, 'I want to stop [going to school] because I'm wasting your money," he said. "I had developed a drug and alcohol problem." Failing at university and staring at liver failure, the then 22-year-old Gwala said he had to make a drastic lifestyle change if he wanted to see 30. Unsure of what direction to go, a friend suggested he try out for a lifesaving job, since he knew how to swim and it'd be a healthy lifestyle choice. After two weeks of grueling tryouts in the pool, he landed the job. "I fell in love with lifesaving and I decided I have to start doing [this]," Gwala said. This profession didn't completely cover the bills at first, so he moonlighted at a factory -- a job which he ran to -- and from -- every day. He credits that commute for his speediness. He joined Durban's Marine Surf Lifesaving Club and began competing in beach swim-run events. After winning two races, including the South Africa Lifesaving Championships, he realized he could swim and run pretty well, so why not add in biking and try a triathlon? In 2015, Gwala started placing in his age group in local triathlons. Later that year, he was invited to the US to represent South Africa in the ITU World Triathlon Grand Final in Chicago. Two weeks before the big race, he was in a bike crash. Still, he competed and came in 57th place in his age group. Making strides for his country, competing again in the ITU World Finals in 2017, and competing in longer distances -- like Ironman 70.3 events, Gwala was starting to get serious about triathlon. Except "people tried to stop my career," said Gwala, though fighting back tears he's unable to say much more about the life altering attack that changed everything. In March 2018, during his routine early morning ride near the University of KwaZulu-Natal, Gwala was attacked at gunpoint by three men and pulled into a nearby bush. According to Gwala, they began shouting at him in a foreign language and then pulled out the chainsaw. The men managed to cut through 90% of his tibia, and 80% of the surrounding tissue on his right leg, according to Dr. O'Sharran Singh. It made some lacerations to the left leg, but miraculously, the chainsaw seemingly stopped working and the men ran away, according to Gwala. He was rushed to the hospital, where his doctors were able to save his leg. But they told him it would be two years before he could run again. Five months after surgery, Gwala was running again. Today he's running up to 6km. It may not be fast, or pretty; he likens it to how a crab would run, but aesthetics don't concern him. "The first time we got him on the treadmill running it was very emotional," said Jarrod Rudolph, his physical therapist at Prime Human Performance Institute in Durban. "For us to get him to achieve that in a five to six month period post-op was a remarkable thing and it really boils down to his attitude," Rudolph commented. It's still a very long road to his recovery. The nerve damage may take up to two years to heal, according to Team South Africa's Olympic doctor Kevin Shubban. But, remarkably, Gwala is doing everything he was doing before, just with a limp. Gwala has qualified as a para-athlete. His goal now is to compete at the Tokyo 2020 Paralympic games in either the paracycling or paratriathlon events. "That is my big motivation. That makes me wake up every morning because I need to get strong if I'm going there, and make South Africa proud of me," he said, "I'm hungry for success, ha ha." Another big motivator for Gwala is Olympian Josia Thugwane, the first black athlete to earn an Olympic gold for South Africa. Thugwane was shot five months before he was set to compete in the 1996 Olympics in Atlanta. The bullet grazed his chin, and injured his back. Defying all odds, he made an amazing recovery and went on to win the marathon. "Whenever I'm going to race I have to watch his documentary. He makes me feel strong." To this day, Gwala has a hard time talking about the chainsaw incident. He still doesn't understand why he was attacked, nor do the police who say they are no closer to catching his assailants. "I forgive them. I can't forget. I'll always remember. Every day, every hour," he said, "but I won't remember it as a bad thing." Alcohol took his life away. Triathlon gave it back. This attack may have slowed Gwala down, but he's more determined now than ever to make it to the top. That's why he trains day after day, training not just for himself or his family, but for his country and for a goal that's bigger than himself: Tokyo in 2020.